Jim Davis, pilot, airplane builder and four-time cancer survivor arrived at Newport Airport today to take Jan Parmalee of Goshen NH for a plane ride. 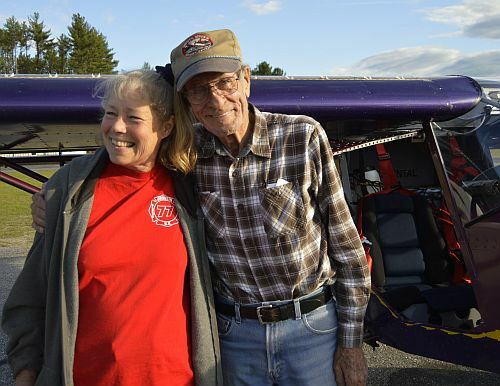 Newport was the 16th stop on his bucket list for visiting each of the lower 48 states and giving cancer patients and survivors a ride in his plane that he made from a kit. Davis says it is important for people to get checkups even if you are feeling well. Davis says he is walking miracle the doctors told him he would be on oxygen 24/7 and in a wheelchair for the rest of his life. Besides beating cancer 4 times Davis has had triple bypass surgery, has diabetes and degenerative disc disease. Davis says cancer is not a death sentence and people can get depressed or motivated and he chose to get motivated. Davis will spend the night in Newport before heading for Rutland Vermont and the rest of the lower 48. Sunapee Police took a Manchester man wanted on various arrest warrants into custody Monday. Police say they stopped Patrick Devine 25, after receiving reports of an erratic driver on Bradford Road. Police discovered that Devine had warrants out for his arrest from Manchester Police, for Aggravated Felonious Sexual Assault, Kidnapping, Criminal Threatening, Second Degree Assault, and Simple Assault. Devine of 155 Bellevue St. Manchester was processed at Sunapee and Manchester Police took him into custody at Sunapee. Vermont State Police suspect a woman who went missing in late January is the victim of foul play. Denise Hart 23 was last seen leaving a friend’s home in Sudbury VT on January 25 late in the evening. On Monday, a 2003 Silver Pontiac Grand Am was found fully engulfed in flames at the Cornwall Covered Bridge in Cornwall. Police did not learn of Hart’s disappearance until January 31 or that the Grand Am she borrowed from a friend was the car involved in the fire. Police have conducted several land, air and water searches in past months with the most recent one in Rutland and Southern Addison on Thursday. Detectives continue to follow up on active leads and strongly encourage anyone with information to contact the Vermont State Police at 802-773-9101Any information, no matter how insignificant it may seem to you. fDonald J. Trump named Phil and Cindy Howard of Claremont on Thursday as members of his New Hampshire Leadership team for Sullivan County. 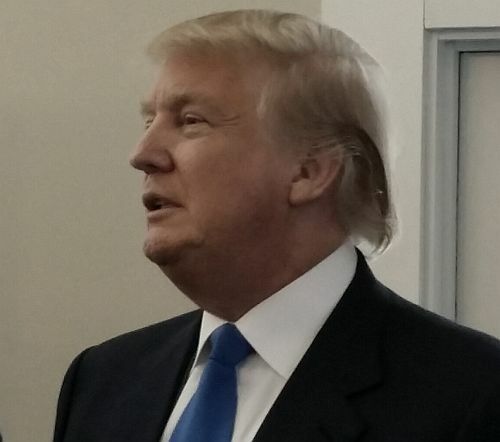 Trump named representatives from all ten New Hampshire counties. Trump adds the leadership members to his four full-time staffers in the Granite State and an office based in Manchester.